Making the decision to get married and plan a wedding can be the source of both great joy and huge stress at the same time. Apart from the excitement of starting life with your favorite person, there is a tremendous amount of planning for your special day as well as for the rest of your life. Our team of lawyers is adept at guiding you and your spouse through the sometimes difficult or emotionally awkward legal process of creating a prenuptial agreement. First and foremost, you wish to protect your partner and their best interests because they matter more to you than most anything else. While it may seem impossible to imagine that this could ever change, wishing to ensure they are protected and secure in their future is a part of entering into marriage. Another way to think about it is, creating a prenuptial agreement has similar reasoning as a formal will — you’ll no longer be there to protect them or vice versa. If the relationship should end, being able to think clearly and calmly about these plans may not be within reach at the time. Take care of these arrangements early and peacefully. Talk to one another about your prenuptial agreement as a deeper promise to your love, that you trust it’s longevity. Enter this process knowing that if your marital bond should ever change, right now you wish for each other to feel protected and secure. Equally, remember that you make the prenuptial agreement based on what best fits your lifestyle, and that the prenup can be set for a specific time frame instead of open-ended. The purpose is to best match whatever makes you both feel comfortable and secure. A prenuptial agreement is not a damaging contract for your love; it is a way to honor your partner’s future before it may feel too challenging to do so, which we hope never happens. There are many reasons to seek a prenuptial agreement, which all point to the same desire: peace and security. For example, if you intend to have children, a prenuptial agreement is essential not only to your own security but more importantly, to theirs. Should split custody enter into your family’s future, ensuring both homes have the best resources for raising your children is essential. 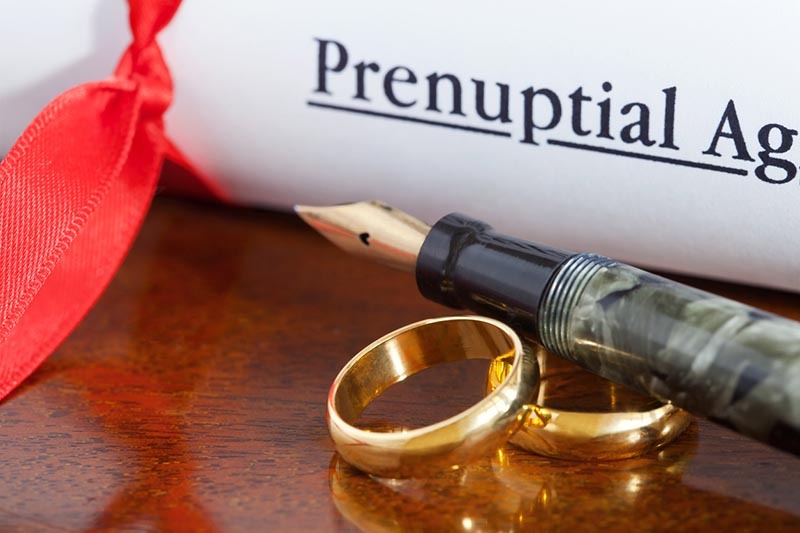 There are many other reasons than the list above to make prenuptial agreements, such as if your spouse is much wealthier or indebted, if you own a business together, own multiple properties, etc. No matter what the reason, there is always a peaceful and productive way to have that conversation and come to amicable and respectful choices. Debt: Is there any, and if so, how much? Credit score: Is it good, bad or in the middle? Will it affect the ability to rent or own a home? Assets: Are you wealthier than your spouse? Do you have inheritance or trust funds to protect? Everything has to be out in the open. Future Purchases: Do you plan to buy a home, cars, vacation property, boats, etc. together? Children: Do you plan to raise children together? You cannot decide on custody through a prenuptial agreement, but you can determine the ways to support your children financially, beyond the marriage. Income: Will one of you be the primary source of income while the other stays at home with the children? Either way, but especially if one spouse stays home, discussing alimony and child support beforehand is very important. While divorce rates are unfortunately high, the percentage of Canadians who cover their major assets with prenuptial agreements is exceedingly low. Verhaeghe Law Office will walk you and your future spouse through every step of the prenuptial agreement process, ensuring both parties are well informed and comfortable. Communication, preparedness and honesty will make the entire process run smoothly and help keep emotions calm. Our lawyers are here to represent both of your best interests, and will do so astutely. For more information about how Verhaeghe Law Office can guide you through a peaceful prenuptial process, please contact us by giving us a call at (587) 410-2500. This entry was posted in prenuptial agreement by verhaeghelaw. Bookmark the permalink.